The ETS-T40F series is suitable to all kind of systems thanks to its space-saving design and has a perfect balance between cooling performance and noise level. 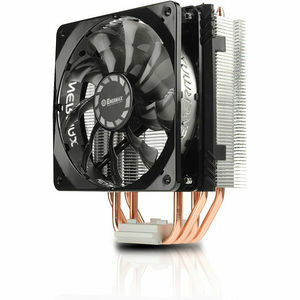 The slim heatsink doesn't interfere with the RAM slots and allows the installation of high end modules. Innovative technologies such as the Vortex Generator Flow (VGF) and the Vacuum Effect Flow (VEF) ensure optimum airflow and efficient cooling. The ETS-T40F coolers can support a TDP up to 200 watts. Enermax offers three versions with different Twister-fans: the ETS T40F-TB with the popular TB Silence PWM 12cm fan, the ETS-T40F-BK with the blue LED fan TB Apollish PWM 12cm fan and finally the ETS-T40F-RF with the new 14-cm-winglet fan.